Exciting things are happening at Golden North! We are thrilled to announce a new logo and new look for the Golden North 2 Litre range! We have conducted consumer research across the country to discover what is important to consumers about ice cream. All respondents commented that Golden North ice cream is premium creamy and delicious, but it needs a higher quality look on branding and packaging. 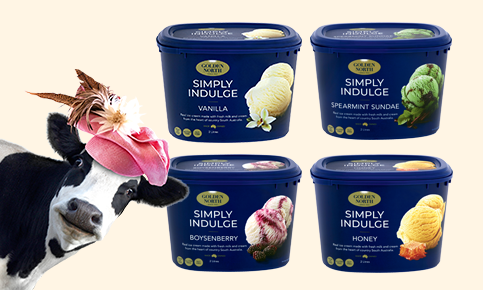 We also needed to introduce a name for our 2 litre range, therefore, the new “Simply Indulge” branding was born to match the quality of the product with the packaging. To celebrate with the birth of the new packaging, we have launched two new flavours at the same time – Vanilla Sundae & Spearmint Sundae. Golden North’s signature creamy ice cream with luscious chocolate sauce rippled through – the perfect dessert to South Australian families!